Keep glass and plastic streak free with Mckee’s! 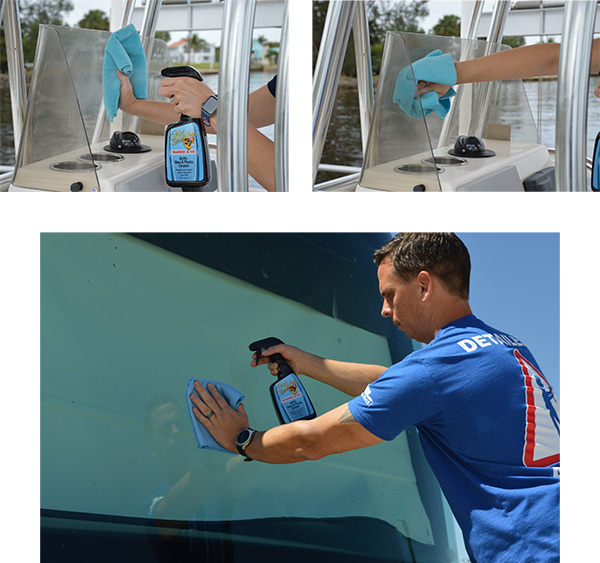 McKee’s 37 Marine & RV Repel Glass & Plastic Cleaner is the only glass cleaner you need, even if you typically struggle with the task. This unique formula is safe and effective on glass and plastic, so it’s ideal for use in and around your boat, RV, and even your home! McKee’s 37 Marine & RV Repel Glass & Plastic Cleaner is perfect for windshields, mirrors, interior windows, instrument clusters, vinyl windows, and more AND it’s 100% ammonia free and alcohol free so it’s safe for use on tinted windows. Most people can agree on one thing: Glass cleaning is one of the worst chores on the list! The you finally talk yourself into doing it, using the wrong products will leave you with a streaky, hazy mess, but it doesn’t have to be that way! Not only will your glass and plastic surfaces be cleaner when you use McKee’s 37 Marine & RV Repel Glass & Plastic Cleaner, they’ll also stay that way longer between washes thanks to the built-in water repellent! McKee’s 37 Marine & RV Repel Glass & Plastic Cleaner is perfect for windshields, mirrors, interior windows, instrument clusters, vinyl windows, and more AND it’s 100% ammonia free and alcohol free so it’s safe for use on tinted windows. 1. Ensure surface is cool to the touch. 2. Spray cleaner directly onto surface. 3. Wipe clean using a high quality, lint-free microfiber towel. 4. Use a second clean, dry microfiber towel to buff off any excess. 5. Repeat if the glass or plastic is heavily soiled. McKee’s 37 Marine & RV Repel Glass & Plastic Cleaner 128 oz. McKee's 37 Marine & RV Mildew RemoverMcKee’s 37 Marine & RV Mildew Protectant SprayMcKee’s 37 Marine & RV Water-Resistant Vinyl ProtectantMcKee’s 37 Marine & RV Gloss Enhancing Final PolishMcKee's 37 Marine & RV Hydro Pearl Sio2 CoatingMcKee's 37 Marine & RV Final Step Detail WaxMcKee's 37 Marine & RV All-In-One Fabric & Vinyl CleanerMcKee's 37 Marine & RV Carnauba Wash & WaxMcKee’s 37 Marine & RV Heavy Duty Cleaner WaxMcKee’s 37 Marine & RV All Purpose Surface CleanerMcKee’s 37 Marine & RV Bug Remover & Wax RestorerMcKee’s 37 Marine & RV Vinyl Decal & Graphic RestorerMcKee’s 37 Marine & RV Heavy Cut Oxidation RemoverMcKee’s 37 Marine & RV Carnauba Sealant WaxMcKee’s 37 Marine & RV One-Step Polish & SealantMcKee’s 37 Marine & RV Repel Glass & Plastic Cleaner 128 oz.McKee's 37 Marine & RV Final Step Detail Wax 128 oz.McKee's 37 Marine & RV Carnauba Wash & Wax 128 oz.McKee's 37 Marine & RV All Purpose Surface CleanerMcKee’s 37 Marine & RV Bug Remover & Wax Restorer 128 oz.